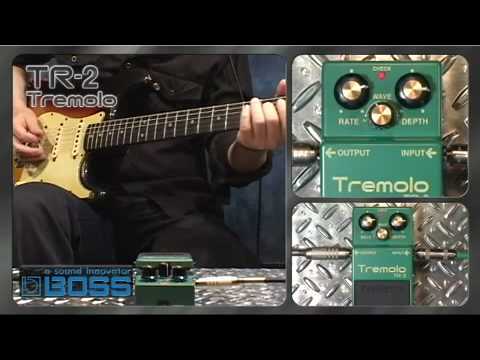 The Boss TR-2 Tremolo Guitar Effect Pedal allows you to add anything from subtle wobble to shimmering effects that elevates your rhythm and/or lead tones. Tremolo is an essential effect in any guitarist’s repertoire, and can make the different between a flat-sounding tone, and that of a guitar hero. As you'd expect, the stompbox is built to an incredibly high standard of quality, with a satisfyingly robust pedal switch that can withstand anything you can throw at it on tour. Whether you're a bedroom dreamer or a stadium filling virtuoso, the TR-2 gives you effortless tremolo control in tank-like and compact pedal. The layout across the TR-2 front panel is comprised of Depth, Rate and a variable Wave controls. The Depth controls allows you to sets the intensity of the tremolo sound, allowing you to dictate whether the effect varies the volume in a barely audible manner for a gentle response, or has a more dramatic drop-in/drop-out character. Rate controls how fast the tremolo responds, going from soft and lilting undulations to rapid-fire shimmer. The Wave control allows you to attenuate the modulation and sweeps from a sine wave to a square wave, enabling you to dial a soft to grittier tremolo sound. As with all Boss pedals, the layout is intuitive and you'll be up and running in no time. Whatever style of music you play from surf rock to country, pop to punk, rockabilly to reggae, the TR-2 can produce sounds that are perfectly suited to any and every style. The Boss TR-2 works well in isolation, putting It before your amp to lift your amp’s natural tones. But it also plays well with others, such as overdrive, reverb and delay. If you’re looking for a chunky rock-inspired tremolo, pair it with your favourite distortion pedal. If you’re trying to get a more post rock inspired tone, then partner the TR-2 up with your favourite reverb pedal to create some truly wonderful soundscapes. As previously stated, the chassis of the TR-2 is built to take all the usual punishment that comes with being at the mercy of an enthusiastic guitarist’s feet. Boss put their stomp boxes through rigorous product testing to guarantee their resilience, and it’s clear to see why they are a regular fixture on many a legendary guitarist’s pedalboard. Grab a Boss TR-2 Tremolo guitar effect pedal today and see what all the fuss is about for yourself.